On January 5, 1998, I landed in New York City with an immigration visa that I won in the Green Card Lottery. The previous summer, I had received a letter in the mail notifying me that I was one of 55,000 lucky people whose number was drawn in the Green Card Lottery from more than eight million participants. Winning, however, was only the first, easy step. What followed was a thorough and costly screening process to make sure that I was who I claimed to be, without a criminal record, in good health and able to support myself for a few months in the United States without working. I have often wondered how Green Card winners less fortunate than me made it through that process. Unlike many other immigrants, I came with a university degree and some money, and I had the option to go back to my home country if things didn’t work out although I was fiercely determined to make it. I repeated Frank Sinatra’s New York song, “If I can make it here, I can make it anywhere” to myself like a mantra. Despite my favorable starting position, the first few months in New York City were scary. I did not know a soul, my savings were dwindling at dizzying speed and when I started interviewing for jobs I realized pretty quickly that my work experience abroad did not count as much as I had expected. While I was waiting for my social security card to be issued, I explored the city by foot. Through the windows I saw people dining at fancy restaurants, and I walked by homeless sleeping on newspapers, wondering at which end of the social spectrum I would end up. 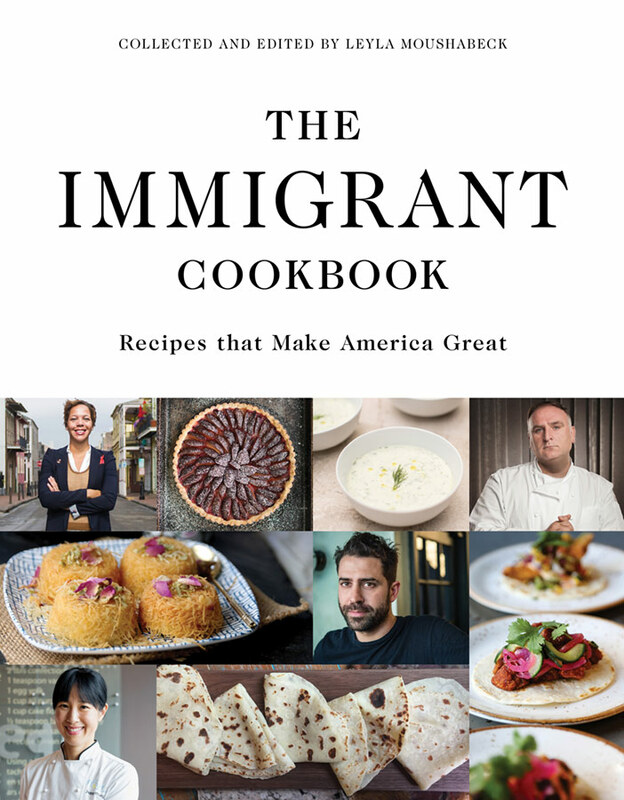 My 20th anniversary in America coincides with the publication of The Immigrant Cookbook, a book that raises funds for the ACLU’s Immigrant’s Rights Project. I am immensely thrilled to have contributed a recipe to that book, not only because it is for a great cause and I am in the company of famous chefs and food writers but because food, beyond mere sustenance, always held a special role for me since I set foot here. Food has opened doors, connected me to people and the land and made me find my place. After I married a man who was a widower with two young children whom I adopted, the food I cooked helped me find my role in that new family. Becoming a parent in the void that the death of the children’s mother had left was a daunting task although everyone welcomed me with open arms. It was me who felt that by definition I would always be the understudy; the only area where I felt I was in unencumbered, unclaimed territory was food. Slowly, over the years, I was able to take on a role in my own right. Now each time one of the children, who are both grown and live on their own, proudly sends me snapshots of a dinner they’ve cooked, it is like a proof that it has all worked out and something of me has rubbed off on them. Food also made me a gardener. Despite living in a rural area, we are in a food desert with little access to fresh food because farmland has been rapidly disappearing. Sitting on a sizeable plot of land, in a climate that allows me to grow both cold-weather crops like my beloved Old World berries (gooseberries, red and black currants, elderberries) as well as melons, and with ample precipitation and access to water for irrigation if necessary, it would have been a shame not to start growing my own food. Through food, and writing about it, I have found new friends, in the next county and at the other end of the country, who share my passion for cooking from scratch with fresh seasonal local or homegrown ingredients. And food has created a deeper level of connection to this area for me, where many families go back generations and my husband and I are still viewed as relative newcomers. I know by their first names the growers at the orchard where I buy peaches every summer weekend and apples in the fall, the cheese maker, the young couple who started a mushroom farm, and the owners of many other local food businesses that have thankfully sprung up over the past decade as part of the local food revival. This gives me a feeling of belonging and familiarity that I wouldn’t have if I bought everything at a supermarket. And food has helped me to stay connected to my roots. I left Germany with a grudge; I could and did not want to accept that visibly having non-German genes (my mother is German and my father is Tunisian) I constantly had to explain my background. That’s why I participated in the Green Card Lottery and did not hesitate a moment to leave. But as I became part of an American family, something strange happened. Everything in the children’s world was new to me: Dr. Seuss, school lunches, baseball, macaroni and cheese… I realized that catching up to the American lifestyle and culture would take forever and would always remain patchwork since I had spent the first decades of my life in a foreign country. I started introducing a few elements of my German upbringing into our family, and when the publisher where I had first worked back in New York City offered me to write a German regional cookbook, I said yes. The book Spoonfuls of Germany was followed by a blog and that acquired a life on its own. By exploring German cuisine I have made peace with the German part of my identity. It’s been many years since I have been in Tunisia, and I miss it. Before moving to America, I visited often and once worked there for six months. Only as an adult did I finally come to grips with the fact that my mixed genes was a positive and valuable thing, and that my being half Arab was not something I had to hide and be ashamed of, which was the dominating feeling during my childhood and youth in Germany. While we had two children in college, and my husband’s ageing parents to worry about, there was no time and resources for a trip to Tunisia. Still, I wanted to hold on that part of my identity, too, and food is a way of doing that. I was in my last year of high school when my Tunisian grandmother died, and the memories of her are slowly slipping away. Cooking the dishes she made for me, whether it’s the Tunisian grilled vegetable salad Mechouia in the summer or an orange tea cake in the winter keeps her in my thoughts. I am starting my twenty-first year in America with very mixed feelings – on one side outrage, anxiety, desperation and disgust about the state of the nation, and in that respect the past year has been the worst year since I came here. On the other side, I have also seen how this very situation has brought out the best in people. I have met more wonderful and dedicated like-minded people around me than in all the previous years combined. There are more women running for office than ever before, also locally. There are folks coming together for charity causes and political activities. Sharing and caring has emerged, and I hope this newfound sense of empowered community will continue. Maybe the country will rise and come out of this crisis better than before. Like I wrote on this blog before, I am trying to look at it as a gardener: replanting a new bed is messy and unsightly in the beginning, and it takes muscle power, sweat, patience, perseverance, and quite a few blisters and calluses to turn it into a pretty flower bed or into a new productive vegetable plot. During my first few weeks in New York I survived on cheap Chinese takeout; I ate half for lunch and the leftovers for dinner. I also forced myself to have a (free) peanut butter and jelly sandwich at the bed and breakfast to keep me going although I have never been a breakfast eater and start the day with just a large coffee with hot milk. Since then I haven’t had Chinese takeout again and frankly never want to but I still love peanut butter. I only make these peanut butter and jelly bars when I have grape jelly from homegrown grapes (which I couldn’t handle without a steam juicer, you can read me singing the praise of that gadget here). Adding Greek yogurt instead of shortening or butter to the pastry is a little twist that I got from a low-fat German pie crust with quark (which can be easily substituted with low-fat Greek yogurt) and oil. 1. Preheat the oven to 350 degrees F (180 degrees C). Lightly grease a 10×14-inch (25×35 cm) jellyroll pan and cut out a piece of parchment slightly larger than the size of the pan. 2. Whisk together the Greek yogurt, sugars, egg, vanilla, and peanut butter until smooth. 3. Add the flour, baking soda, and salt to the peanut butter mixture. Stir until everything is well combined. The dough is dry and stiff but should hold together after some stirring. If it remains crumbly, add 1 tablespoon milk. 4. Using a lightly floured rolling pin, roll out two-thirds of the dough on the parchment to fit the jellyroll pan. Place it with the paper into the pan. Mix the remaining dough with the oats until well combined and set aside. 5. Place the baking sheet in the preheated oven and bake for 15 minutes, or until firm and lightly colored. 6. Stir the jelly until smooth and spread it evenly over the prebaked pastry. Drop the oat mixture over the filling in streusel-like pieces to evenly cover the entire pan. 6. Bake in the preheated oven for another 20 minutes, or until browned and crisp. Remove from the oven and pull with the parchment onto a rack. When almost cool, place on a cutting board and cut into bars. Return bars to cooling rack and let cool completely. Store bars in an airtight container in a cool place with wax paper between the layers. < As American as apple pie? Thanks for sharing your story…. I love to learn how people came to live here. Always an interesting experience. My mother came from Greece. I believe the U.S. will return to being a shining light for immigrants. It’s really ingrained in our identity. Such a lovely post, Nadia. A gift outright for this new year. Thank you. Gestur, Glad you liked it. I appreciate the kind compliment. After reading all your great Blog I feel I know you better. Looking forward to our visit in May! Warm hugs to all of you. Thanks, Jonny. We are very much looking forward to your visit too!